Boston Globe, what are you doing? This week the Globe printed a ridiculous one-sided crybaby piece from someone who chose to become a public figure but didn't like having her own words used against her. Wellesley College economics professor Julie Matthaei was one of 600 academic economists who signed a letter of support for raising the federal minimum wage to $10.10 an hour. 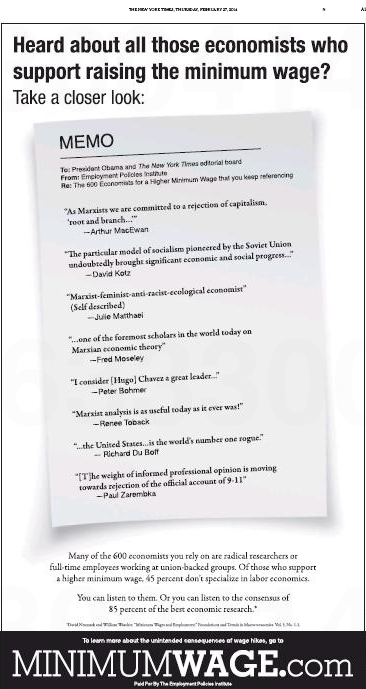 A right wing group called the "Employment Policies Institute" printed this critical ad in the New York Times quoting Mattaei and seven other people who signed the letter of support that shows those people saying radical things that expose them as Marxists, socialists, Stalinists or 9-11 conspirators. In short, the Employment Policies Institute (which is not a real institute) is saying that the "600 economists" who lined up to support raising the minimum wage has some crushed drywall mixed in with its cocaine for bulk. The Times ad, taken out by the nonprofit Employment Policies Institute in Washington, had a distinctly 1950s flavor, employing excerpts from quotes that used derivatives of “Marx” four times, praised Soviet-style socialism, and questioned official accounts of the Sept. 11 attacks. Keep in mind that it was the reporter declaring the ad had a "distinctly 1950s flavor" and not Matthaei. There is no issue with the Globe quoting Matthaei as saying things like “I felt I was being red-baited” because that's a statement attributed to her, the focus of the piece. The problem is when the reporter used similar opinionated language to paint a picture, and the reporter here most definitely did. The Employment Policies Institute did not prove that all 600 economists who signed the letter are batty. It instead said what people who lack supporting data always do and hid behind vague wording. It said "Many" of the 600 economists are radical researchers. That's not a slam dunk, and it ignores people like Kenneth Arrow, one of six Nobel Prize winning economists who signed on. But what's completely fair game is holding people responsible for their actual words and beliefs. Matthaei really is an anti-capitalism Marxist who lives in a commune. Just like alternative medicine nonsense has infiltrated higher education despite being completely at odds with reality, so has Marxist economics. Matthaei is part of that sect of academic Marxist economics, and they should be seen as a separate group, like we see doctors and witch doctors as separate groups. For what it's worth, economists now have a lot of debate on the minimum wage, and as Greg Mankiw said, there are hundreds on both sides of the argument.